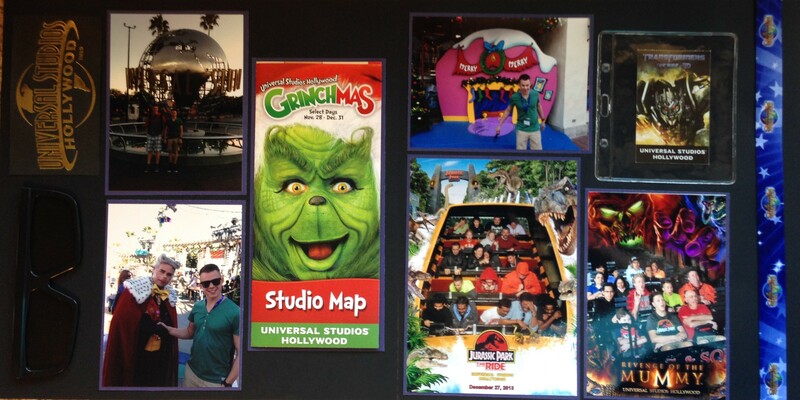 Another adventure that we had while in California for our Christmas break was a trip to Universal Studios. We gave Luca, our exchange student, the choice of which amusement park he wanted to visit while in LA, and this is the place that he chose. As usual we arrived early so that we could get into the park first to get on popular rides before the lines became too long, and we were glad that we did. You can see from the top left picture that we were taking pictures at the park when the sun was still rising! We had pretty much done everything before 1pm, so we ate lunch in the park, and then left around 2pm. The lines for some of the rides when we left were over 3 hours long. I purchased lanyards and ticket holders for our tickets – they are a little expensive – but I have learned that I like to have them for the scrapbooks once the event is over. I also purchased the ability to have electronic versions of the ride pictures so that I could print them myself for the scrapbooks. Since I was creating a scrapbook for each of my boys I knew I would need multiple copies and it was cheaper to order the pictures this way. The ephemera on this page includes the park map, a gold logo which I cut out from the bag from the gift shop, and a pair of 3D glasses which was mistakenly brought home. I carefully used an X-Acto knife to cut off the ear pieces so that it could lay flat on the page. I also affixed the park map to the outside of the plastic protector sheet so that the viewer could open it. Universal Studios Hollywood General Admission Ticket – $91.99. Get ready for the ultimate Hollywood movie experience! Go behind the scenes on the world famous Studio Tour to explore where Hollywood movies are made. Then, face action head-on in heart-pounding rides, shows and attractions that put you inside some of the world’s biggest movies. Be part of the battle as you embark on a mission to defend the Allspark from the evil clutches of the Decepticons© in TRANSFORMERS™: The Ride 3D.